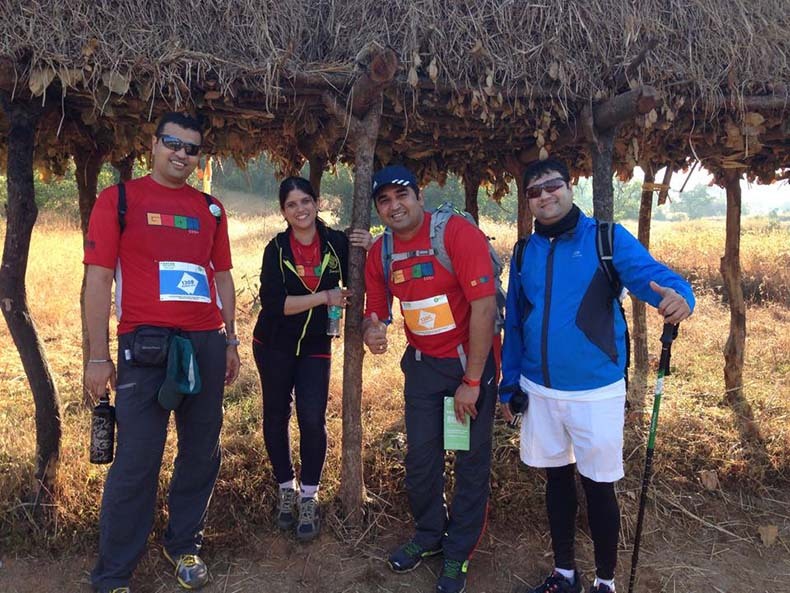 What a feeling : Manish in blue relaxing with his 100 km oxfam trail walk team. He has always known life to be busy until one day when he realized that it was not worth being unhealthy. He was sick of being fat and always heard from people around him how he needed to lose weight for his own health but, that just made him more frustrated. He knew that for it to stick, he needed to be the one who decided to get healthier. 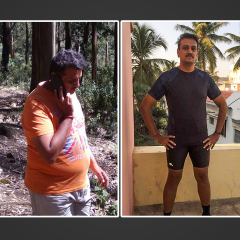 Today, he easily walks 10 km, clocks on an average 7k to 8k steps daily and is walking the path of fitness. Here is Manish Karve’s experience in his own words. I work for a managed analytics company. I used to manage operations and more often than not worked the night shift. My work got the best of me, spending a significant amount of time in office sitting in meetings or in front of a screen. Add to the inactive life I led, I had terrible eating habits. The net result of all this was that I was unhealthy with ailments like back aches and perennial cold and cough. My family life was suffering considerably. The time I used to be at home I spent sleeping. I was overweight. Like most people, life carried on. I was eating wrong and never had the time or desire to exercise. I did try my hand at playing a sport, going to the gym for working out but nothing really worked for me as I was not able to do anything that brought about a lifestyle change in me. I was nearing 40 and I thought to myself what was I doing with myself? I was scared for my health. Given thatI worked with data, I thought a wearable might be a good idea, I tried the Jawbone Up but, it was a standalone fitness tracker and that connect with people was not there. It just helped you track what you do. So I gave that up as well. Then I had a chance meeting with Vishal Gondal who happens to be my schoolmate. During this meet he mentioned to me about GOQii and sent me a link for the Beta.Six months after the beta testing started I got a GOQii band for myself to try it out. Best decision ever! What appealed to me a lot about GOQii was the personal coaching. There are qualified nutritionist, dieticians and other specialists who can help you chalk your fitness and health goals the right way. 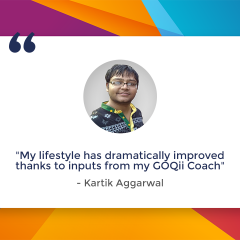 Unlike all the other things I tried to do to get fit and healthy, GOQii did just one thing-it kept me engaged thanks to the coaching. 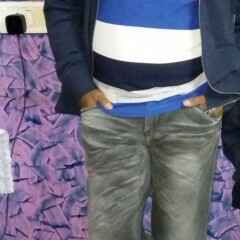 My coach NehaMorche has done a brilliant job. She became my coach when I was at the crossroads of an unhealthy lifestyle. She did not come up with dramatic goals to achieve. She asked me to take baby steps and go slow. She brought about simple changes in lifestyle and nutrition which has helped me a lot. She also helped me be more active. As I started getting active on a daily basis, I started improving my diet. I began walking one km in the beginning. 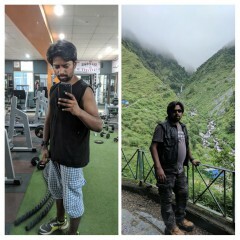 Initially, it was difficult but, I stayed that I was going to achieve my goal of losing weight and increasing my stamina.I increased my walking and then took to running as well. I initially remember thinking how hard clocking 10,000 steps would be. But, I sweat through it and eventually it got easier. Today, I am regularly going for walks, cycling at times and I actually go to a gym with a personal trainer. I have been able to easily run 10kms now. I did the 10 km run at Thane in February. I finished that race in just about an hour and a half. What an achievement I thought. I was so fired up! Now, I can walk 10-11 km without a huff. Two years ago I could not have even imagined doing all these things that I am currently doing. I clock on an average 8k to 10k steps daily. For me, I have to look at the GOQii app and see what I have done in a day to keep myself motivated. As my fitness levels increased I also brought about a change in my nutrition. My coach brought about simple changes. I was such a lover of junk food and especially chaat. But, she did not ask me to stop it but instead told me instead of having a Bhel why not go have SukhaBhel with lots of nuts etc which is healthy. She gave interesting tips on what snacks to carry and what not to eat. I have also significantly reduced my intake of Coffee and tea. I would eat fruits whenever I want to and Neha helped me understand few realities about when and how to eat fruits. She threw open lots of challenges to me and also gave great tips. In terms of activities too we worked up strengthening core and leg muscles. I then participated in the 2014 Mumbai 100 Oxfam Trailwalk and completed it successfully. That further gave a boost that I could do it if I wanted to. Then I also did the Trailwalk again in 2015. Talk about being a glutton for punishment. My wife has seen the positive change in me and is happy. All in all I feel positive and another aspect of positivity is also being able to donate karma points. Till date I would have donated close to about 8k points. My plan is to continue living this healthy lifestyle. After all, there is lot of belly fat to lose. Is what I did that amazing? I don’t think so. I think it’s something that anyone can do. It didn’t cost a lot of money, but one has to be disciplined and dedicate time. Having a time commitment is important to achieve a health goal. I made an effort to be disciplined, gave up junk food and guess what? It is all so worth. I realized my reason to get healthy was more than just a want. I realized that if I want to be healthy, I have to decide to do whatever it takes and make it an everyday, lifestyle change. What does Coach Neha Morche have to say about Manish? Manish and I initially started work on increasing activity levels to increase stamina and be energetic as a goal. He wanted this as his goal as he travels a lot on work and always has a busy routine to form an activity routine for himself. Considering this I suggested some easy exercises which can be performed in the hotel room as well. Then he participated in the 100 Km Oxfam Trail walk in December 2014. It is only after successfully completing the trail walk that he realized that he needs to work on his belly fats, exercises were suggested accordingly. He put in efforts to follow a routine. Eventually he began to do regular walks and slowly moved on to running. He also got regular with logging in food data and I was able to understand his pattern of meals and suggest balanced nutrition for him. Overall he managed to make lifestyle changes despite his busy schedule.